If you are in the process of creating a hypnosis recording or guided meditation recording, then capturing a good quality voiceover recording will be essential to your success. Do I need to visit a recording studio? Can I record myself at home? How hard is it? What’s it all going to cost? In this article, I’ll discuss what to look out for when selecting a recording studio, and how to properly prepare for your recording session. For those of you who are feeling a bit adventurous (and ready for some technical challenges), I’ve also included some basic tips on how to record your own voiceover at home. Have you written your hypnosis script? Are you now ready to record your voiceover? Unless you are fortunate enough to have the equipment and technical skills necessary to record your own voice, you’ll need to organize a trip to a recording studio. Most recording studios charge by the hour, so it goes without saying that the more organized you are, the less time (and money) you’ll spend on studio fees. What do I mean when I say “organized”? 1. Bring along 2 or 3 copies of your script. There is a chance that the recording engineer will want to read the script while you are speaking it to make sure that you don’t miss any lines. He or she may also need a copy on hand if your voiceover recording requires some audio editing. 2. Rehearse your hypnosis script a few times before you go to the studio, and you’ll feel more relaxed and comfortable about speaking it in front of a microphone. Reason 1. If you can present your background music to the recording engineer on the same day you record your voice, then there is a good chance that he or she will be able to blend your voiceover with the music and complete the production of your recording right then and there. This means you may save time and money and avoid repeated trips to the studio. Reason 2. If you have chosen the background music you want, and if you have it with you when you visit the studio, then you can listen to it while you record your voiceover. This can really help to put you in the right frame of mind while you are speaking, and it can really help to improve the synergy between your words and the music. Some of the therapists I speak to are fussy about where they record…for example, they don’t want to record a guided relaxation in a space that was occupied by a heavy metal band earlier that day! The internet is the best way for you to research recording studios in your area. Many studios focus on recording bands, but there are studios that also specialize in voiceover recordings. A little online research will steer you in the right direction, but if you are still unsure, don’t hesitate to ask studios if they have any experience recording voiceover productions. More and more people are competent with computers and recording techniques these days, and it’s possible that you know someone who has a home recording studio. Perhaps you’ve asked them if they can help you, or perhaps they have offered their assistance. Recording with a friend will probably be more comfortable and cheaper than going to a studio, but if you intend to sell your recording then you must ensure that the person you are working with has a suitable level of technical skill and good quality recording equipment. 1. A (very) quiet recording space. 2. A good quality microphone. 3. Knowledge of correct vocal recording techniques. 4. The ability to mix your vocals with your music and to produce a properly mastered audio file. Tactfully ask your friend if they can answer “yes” to these requirements. If they can, then you may well be able to record your hypnosis production in the familiar comfort of a home recording studio. 2. A good quality microphone (a large diaphragm condenser microphone is one of the most common types that voiceover artists use). 5. A microphone “windshield” – a device that shields your microphone from small blast of air from your mouth while you are speaking. 6. The ability to mix your vocals with your music and to produce a properly mastered audio file using your sound recording software. While it is beyond the scope of this article to provide complete instructions on how to accomplish all of this, I can recommend a few resources that may be of assistance to you. Audacity – Audacity is a popular free audio editor. You can record sounds, play sounds, and import and export a variety of different audio formats. Audacity isn’t the prettiest audio program in the world, but it will do everything you need to create a professional audio production. Sony Sound Forge Audio Studio – An affordable and very well featured sound editing application. Sound Forge™ Audio Studio will allow you to record, edit and master professional-quality audio on your home computer. Free trial. Audacity – Audacity is a popular free audio editor. You can record sounds, play sounds, and import and export a variety of different audio formats. Bias Peak LE – An excellent audio editor for Macintosh. Bias Peak LE is based upon Bias Peak Pro, a more expensive professional audio tool. Peak LE combines pro-quality recording, precision editing, creative effects processing, podcast publishing, and Red Book CD burning. Sure Microphones are a trusted brand that offer a wide variety of mics at reasonable prices. Check out their USB mics for a simpler recording solution. Rode Microphones produce excellent quality, excellent value microphones. Their NT1-A microphone is a great option for anyone wanting to record high quality voiceovers. AKG are another trusted brand that now offer USB microphones at very reasonable prices. This article has been updated and vastly improved! 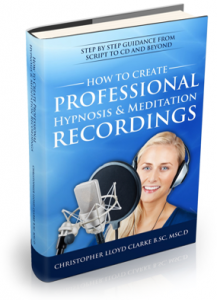 For a far more in-depth looks at how to record a voiceover for hypnosis recordings, be sure to check out this free e-book from our parent website (Enlightened Audio): How to Create Professional Hypnosis and Meditation Recordings.